Enbilulu (Sumerian: 𒀭𒂗𒁉𒇻𒇻 dEN-bi.lu.lu) was the god of rivers and canals in Mesopotamian mythology. In the creation mythology he was placed in charge of the sacred rivers Tigris and Euphrates by the god Enki. Also he was the deity of irrigation and farming. 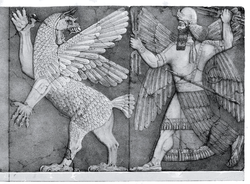 In the Sumerian story Enlil and Ninlil he is a son of Enlil and Ninlil. In Babylonian times he becomes the son of Ea and is connected with Adad. In the Enuma Elish Enbilulu is said to "know the secrets of water" and "of the running of rivers below the earth". Another version calls him "The Lord who makes all things flourish" who regulates for the land the grazing and watering places, who opened the wells and thereby apportioned the waters of abundance. Various translations of Enuma Elish attribute as many as three separate aspects of divinity to Enbilulu. They include the names Epadun ("the lord who sprinkles the field", who knows the most subtle geometries of the earth), Enbilulugugal ("lord of abundance, opulence and ample crops", the power that presides over all growth and all things that grow), and Hegal ("who provides rich rains over the wide earth and provides vegetation for the people's consumption", often called the master of the arts of farming and agriculture as well as one who knows the secrets of metals). This page was last edited on 7 May 2017, at 08:23 (UTC).